There is currently a lack of literary resources for blind and visually impaired students. This is mainly due to the fact that customized learning materials are often difficult, time-consuming, and expensive to produce. Without customized writing tools, these students are not provided sufficient opportunities to learn educational materials in school. Specifically in Korea, it is challenging for blind or visually impaired students to adequately study the underlying principles of Hangul, the Korean alphabet. The lack of customized writing tools makes it strenuous for these students to practice writing Hangul characters and develop a solid grasp of the language. In this study, we introduced three dimensional (3D) literacy learning aids aimed at engaging blind and visually impaired students in practicing their Hangul literacy skills in both reading and writing. After noticing that students between the ages of three and five at the Seoul National School for the Blind lacked the necessary practice to write their own name or other basic characters in Hangul, we developed learning aids using 3D printing technology to help them acquire stronger writing skills. As a volunteer, Jang Hee I noticed that students lacked the fundamental gripping power essential to developing Hangul writing skills. This shortfall in grip power not only hindered the development of writing skills, but in turn also impaired the ability of the students to communicate effectively with the visual world. For example, braille is not always available for blind or visually impaired people in different mediums and braille is not a universal language that most people can comprehend. However, if there were an emergency situation during which blind or visually impaired people needed to non-verbally communicate with others who are not familiar with braille, it would be quite difficult for them to effectively do so without being able to write down their thoughts. Furthermore, by being able to understand and communicate effectively in written characters, visually impaired people may obtain more of a sense of inclusiveness in the visual culture of those who are not blind or visually impaired. Examining the needs of blind and visually impaired students and conceptualizing how to meet those needs with 3D printing technology. Designing suitable 3D literacy tools and investigating how to create appropriate digital file structures for the tools. Fabricating the 3D literacy tools using 3D printers and testing them with a group of blind and visually impaired students to see if the tools were effective in improving their learning of Hangul. In order to collect feedback on the 3D literacy tools and assess the usability of the products, we brought the 3D tools to student groups at the Seoul National School for the Blind. 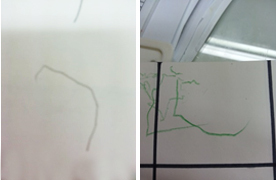 Over a period of three months, we closely observed three kindergarten students with regard to how their writing skills evolved from before utilizing the 3D literary aids to after utilizing the aids for some time. What process is required to transform literary characters into a digital form appropriate for 3D printing? Do 3D literacy aids enhance or improve blind and visually impaired students’ understanding of literary characters and their ability to write those characters? The thickness of the debossed holes and embossed characters are often too thin because they are printed on paper. This makes it much harder for children who do not yet possess strong writing skills to recognize what the characters are. 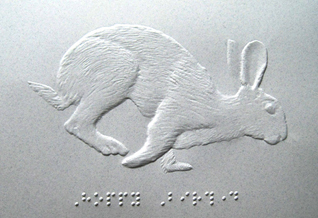 Since the material used to print braille is paper, the characters are easily breakable, and therefore hard to reuse. Braille is just one literacy tool for blind and visually impaired people (Jo, I, Harianto, So, Lee, Lee, and Moon, 2016). Other tools include tactile symbols, real objects, and tactual media (see Figures 2, 3). Figure 1. Embossed and debossed characters from Korean alphabet literacy tool book. As prototyping and printing technology advances, 3D printing is now becoming an advantageous tool to make customized objects with relatively low-cost materials. The mechanism of 3D printing is essentially forming an object systematically, layer by layer. Each layer is a specified thickness of 100 to 400 micrometers. With the ability to create detailed designs and define specific parameters for materials, 3D printing is the optimal tool for constructing high quality customized products. Applications of 3D printing technology include art, construction, industrial design, biotechnology, and numerous other areas. 3D printing has also been used in the education system to help teach educational content to visually impaired students. Several researchers in the past have converted images inside educational literary, historical, and astronomy textbooks to 3D printed tactile books either in plane-based shapes or complete 3D objects (Grice, Christian, Nota, & Greenfield, 2015; Reynaga-Peña, 2015). These 3D printed learning tools were built in order to further engage blind and visually impaired students in educational subjects. For an example, Grice et al. (2015) and Reynaga-Peña (2015) introduced innovative uses of 3D printing technology by translating images of astronomical and biological objects into 3D tactile representations with which blind and visually impaired students could learn by touch. However, they fell short of providing a learning tool which blind students could use to practice their knowledge and reinforce the learning process. The Korean alphabet (Hangul) consists of 24 letters that include both vowel and consonant characters. In this study, we aimed to provide the same amount of information to blind and visually impaired students through their sense of touch with 3D printed objects, as what would typically be provided by seeing the characters of Hangul visually. We also needed to construct braille characters that accurately represented Hangul characters and would be comprehensible to visually impaired students. Thus, we created braille forms of Hangul characters on 3D printed objects in both embossed bumps, suitable for practicing reading, and debossed holes, suitable for practicing writing. 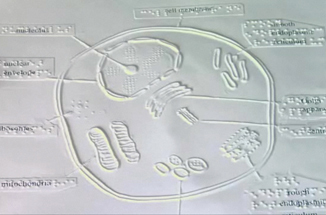 This is demonstrated in Figure 4 where each character tool features two parts: the circular elevated figures represent the braille part for reading, and the debossed indentations represent the braille part for writing. All Hangul characters were designed using Solidworks software with a digital data file that contains information on both the Hangul and braille characters. A computer-aided design (CAD) program was manually used to create the shape of the braille characters in the digital files. Thickness of debossed holes. This characteristic is significant because blind or visually impaired students will trace their pencils along the edges of debossed holes to outline the shape of the Hangul character and practice writing. If the debossed hole is too thin, then the students will have difficulty tracing the character due to lack of stability. If the hole is too thick, then it may be challenging for students to maneuver their pencils around the character. Width of debossed holes. It is important to make sure that the debossed holes accurately represent the dimensions of Hangul characters and are not too big or small for the students to feel. Rigidity of the material that the characters are printed on. If the printed characters are too soft, then the students may find it challenging to grasp or trace them. However, if the printed characters are too hard, then the students may find it uncomfortable to feel them. The sharpness of the edges of the 3D printed object. If the literary aids are printed with edges that are either too sharp or with material that is too rough, then the aids may hurt or cause discomfort to students when they practice writing with them. A total of 24 literacy aids were created, one for each letter of the Korean alphabet. From the CAD data, a stereolithography (STL) file was derived and converted to G-code. G-code is a software code sent to 3D printers that controls how objects are produced, including aspects such as speed, filling, and positioning. The printer selected used fused deposition modeling technology from ROKIT, a South Korean-based 3D Printing Company. Polylactic acid was used as a filament to increase the rigidity of the printed object (see Figure 4). The overall feedback from the blind and visually impaired students was positive. The aids were demonstrated to and used by three students from the Seoul National School for the Blind who were members of the same class where Jang Hee I volunteered as an assistant teacher. Short-answer questions were provided to the students to evaluate the effectiveness of the aids, and the students’ responses were individually reviewed. The students claimed that the aids were effective in helping them practice their reading and writing skills (see Figure 5). From Figures 6, 7, 8, it is evident that there was a significant improvement, especially in the writing skills of the students. One student claimed that, “It was helpful to draw a line and write a character.” For instance, the students mentioned that when they used paper literacy aids, the aids were flimsy and often difficult to hold in one place. This caused frustration when they tried to trace Hangul characters and discouraged them from practicing their writing skills. However, with the new 3D printed literacy tools, the students were able to use them without having the tools move due to the thickness and rigidity of the material. Another student responded that, “It was nice to have a firm and not easily breakable tool.” This also indicates that the 3D printed literacy tools can be reused several times, whereas the paper tools could only be used once. Reusing the literacy tools would reduce materials and cost, making the 3D printed tools a better alternative to existing methods. While most of the feedback from the students towards the 3D printed literacy aids was positive, there are still improvements that can be made. For instance, the students remarked that a few of the 3D printed literacy aids had parts with sharp edges, which made the students slightly nervous when they reached out to use them. 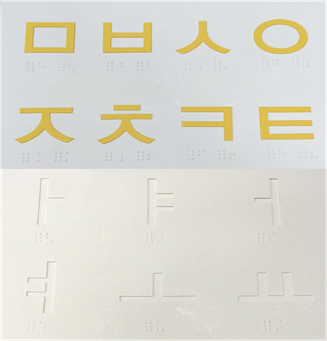 In addition, the embossed part of the literacy aid signifying the braille rendition of the Hangul character was a bit too big, so it was sometimes difficult for the student to recognize what the character was. In this study, the width of the debossed holes was consistent across all aids, but it is possible to further customize each tool by varying its size. For future iterations of the literacy tools, we will consider building each tool according to the visual ability of the student so that they are able to feel the tool better. If the student’s sight is strong, then it would be logical to decrease the width of the debossed holes. If the student’s sight is weak, then it would be appropriate to increase the width of the debossed holes. Through this study, we have successfully introduced 3D printing technology to make literacy aids for blind and visually impaired students. Based on the positive response we received from students, and the improvement evident in their writing skills, 3D educational tools for visually impaired students were a valuable asset to their learning. We have also adjusted the design of our 3D literacy tools based on the feedback from students about the comfort and size of the tools so as to best meet the needs of blind or visually impaired students in the future. From this study, several things about the design of 3D literacy aids can be concluded. One of the most important aspects is that in order to construct the highest quality of 3D literacy aids, it is necessary to consider both the layer thickness of the material as well as the speed at which to move the extruder in the 3D printer. With the positive feedback from this study in using 3D printed literacy aids for the Korean alphabet, it will be insightful to improve the tool and then apply the technique to other educational applications, such as the English alphabet or teaching students how to recognize traffic signs. The 3D printing technology used in this study reveals a variety of opportunities to integrate blind and visually impaired students with the visual world at an early age. This work was supported by Korea Creative Content Agency (KOCCA) in the Culture Technology (CT) Research & Development Program. The research was conducted during a volunteer effort with the Seoul National School for the Blind, and adhered to appropriate subject study protocols and ethics. Jo, W., I, JH., Harianto, R. A., So, J. H., Lee, H., Lee, H. J., & Moon, M. W. (2016). Introduction of 3D Printing Technology in the Classroom for Visually Impaired Students. Journal of Visual Impairment & Blindness, 110(2), 115.